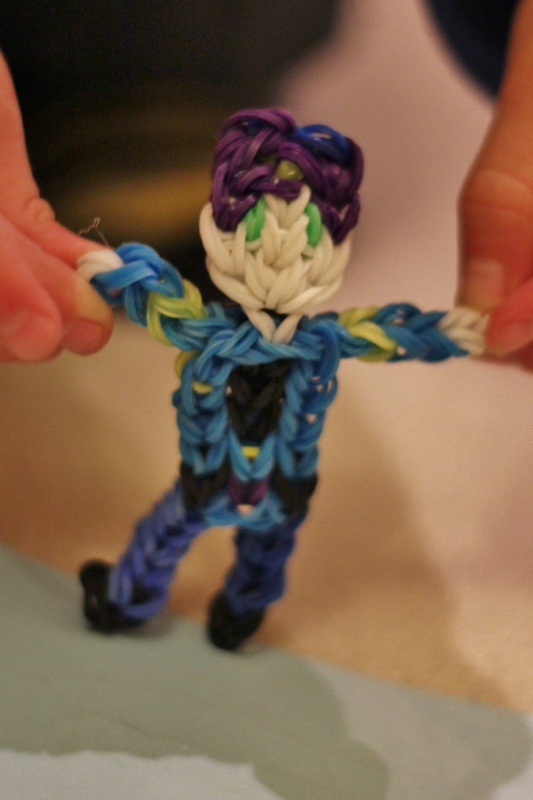 Looming seems to be the latest kids craze all around the world. If you haven’t discovered it yet, then check it out here. Basically, you have a looming board with pegs that you use to weave small elastic bands into many various creations, including bracelets, headbands and even mobile phone cases or little people! Back in my day (really, am I saying that already!?) the equivalent was probably French knitting. Oh how I loved it! I would secretly stay up late, late at night knitting away in my bed, creating all sorts of woven wonders (my most prized creation being a rainbow belt I made with about 10 French knitted strands – I was so hip and happening back then). So anyway, back to looming. My 5 year old son has recently discovered looming. 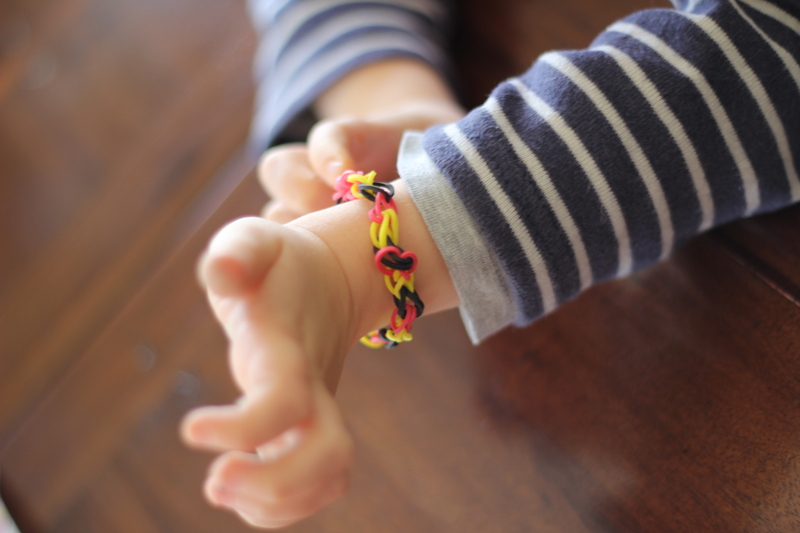 He loves it and has created many colourful bracelets that he wears with pride and shows off to all his friends. His creations are fairly simple beasts when compared with some of the more complex designs (i.e. : he’s a long way off looming himself a mobile phone case). But even with the more simple creations, there is a high level of complexity for little fingers and young minds. Watching him at work the other day, I found that the trusty old Children’s Occupational Therapist hat had snuck onto my head, and before I knew it I was busy cataloguing all the fantastic benefits of this seemingly simple task. I thought I’d share just a few of them with you here. 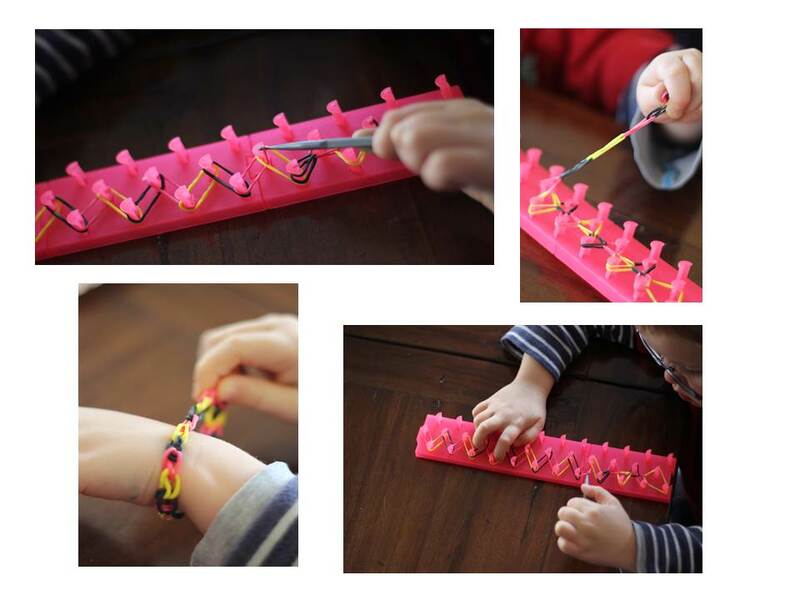 For starters, looming gets those little fingers going! Those tiny little bands require a skilful pincer grasp, and not just to pick them up, but also for hooking them onto the looming board pegs. A well-developed pincer grasp is very important for activities like buttoning or zipping, so looming is a great way to prepare little fingers for this. There is also a small crochet type hook that the kids use to weave the bands from peg to peg. This requires a great deal of dexterity and eye-hand coordination, the exact skills needed for using a pencil for writing. In addition to this, you need to use your two hands together for looming; one hand to skilfully weave while the other holds the looming board very still. Using two hands together like this is essential for other activities like cutting with scissors or using cutlery. Look at those fingers go! The benefits of looming don’t just stop there. It’s also a fabulous introduction to some pretty essential mathematical concepts. Once they have planned out what colours will be needed, your budding mathematician then needs to categorise the bands into their colour groups, and then follow the set sequence (e.g. : red, blue, yellow, red, blue etc) to make their creation. Sorting, categorising and sequencing are all essential, foundation skills for numeracy. The best thing about looming though is that while your kids are busy creating and having fun, they don’t even realise that they’re actually working on their maths, pencil and scissors skills. Boom! Everyone’s a winner! Have your kids caught the looming bug yet? Feel free to share their creations with us. Were you a French knitting fiend (or was that just me)?